Very sadly, our darling daughter Jenni passed away on 7th January 2016. Like so many other children with A-T, she was diagnosed with cancer (Non-Hodgkinson’s Lymphoma of the Liver), in August 2015. She was fiercely determined to live, so I spent many weeks over the next 5 months in Alder Hey Children’s Hospital for 7 courses of chemotherapy, and several days with reoccurring infections at our local hospital. The courage which she faced this devastating diagnosis, was a constant revelation to ourselves, our family and friends. She had horrible side-effects and had to be fitted with a gastrostomy tube as she could not keep food down. After Christmas, which she spent quietly at home with us, she developed a chest infection that rapidly developed into viral pneumonia. She was put into an induced coma, but tragically died in the early hours of the 7th January in the ICU Department of Alder Hey Hospital. When we saw her little body laying there, we saw then, the “true face” of A-T, and we are more determined than ever that other families should never have to go through what we did over those last 6 months. A-T is a merciless and cruel condition that devastates both the sufferers, their family and friends. Effective treatments and eventually a cure must be found. Jenni was our much wanted fourth child, to complete our family. She was born in November 2003, and appeared completely healthy and “normal”. Apart from terrible reflux, which she suffered from as a baby, she was a happy, smiley baby, reaching all her developmental milestones. She began walking at 15 months, which was a little later than our other children, but not significantly so. By 18 months, her walking was still rather “wobbly” and she seemed to have some difficulty balancing when standing still; she appeared much more stable when she was running, however. We started to feel something was not quite right, so after seeing our family doctor, we were referred to a paediatrician at our local hospital. He appeared rather baffled, and eventually referred us to Alder Hey Hospital in Liverpool, to see a Consultant Neurologist who, after various “tests”, declared Jenni to be “completely normal”. We, however, were not convinced, and at our next appointment at Leighton Hospital, our paediatrician agreed that an MRI scan would be a good idea. By now, Jenni was 2 and a half. The scan was a little inconclusive, so she had another one which appeared “normal”. We were still sure something was not right, but over the next 4 years, Jenni continued to see the hospital and community paediatricians and received support from community physiotherapists and occupational therapists. She attended mainstream nursery and started school. 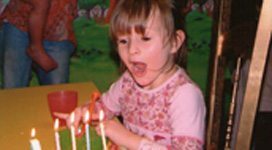 By the age of 5, it was more or less agreed that Jenni either had a form of Cerebral Palsy or severe Hyper-mobility Syndrome. From the age of 6, we, and her school, noticed a distinct deterioration in Jenni’s balance, speech and walking ability. We were all becoming more concerned, and at our next hospital appointment, I broke down in floods of tears, begging the doctor to finally find out what was wrong with our daughter. We could tell that he, also, was concerned about her deterioration and referred her to a specialist neurologist at Manchester Children’s Hospital. She had yet another MRI scan (normal) and was subjected to numerous, stressful blood and urine analysis tests over the next year and a half – Finally, aged 8, last December (2011), she was diagnosed with Ataxia Telangiectasia – Not at an appointment, but in a letter, which I received one morning whilst Mike was away on business. I did not have a clue what A-T was, so I rushed to the internet and sat there, in a state of shock for what seemed like hours. Finally, I rang the counsellor at The A-T Society, and sobbed and incoherently asked for advice. The counsellor was brilliant and patiently talked to me for over an hour. Our consultant rang me up the next day, very apologetically, as the letter had been sent out too early. He had intended to talk to us first. The last year has been very hard on all of us. 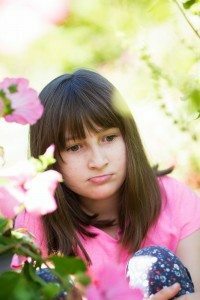 My parents feel guilty that they have “burdened” me with my faulty gene, and thoughts of what will happen to our darling daughter in the future, are constantly in our minds. We made the decision to move Jenni to a specialist school for children with physical disabilities and she started in this September (2012). She uses a walker to get around now, but is still embarrassed about using it at Brownies and if we meet up with some of her old “mainstream” school friends. She tires very easily and we cannot take her on the long Sunday walks with our 2 dogs anymore. She did manage (with support), to climb up to the top of Glastonbury Hill last Easter, but she will be unable to do that again. Soon, she will need a wheelchair for most of the time. We try to be positive. She enjoys disabled gym club and swimming and loves arts and crafts activities, but struggles as her hands now shake quite a lot. She loves all animals, especially our 2 dogs and has an excellent memory for finding things! We know a time will come when she will begin to ask more questions about her condition and we are dreading that day- How can you tell a child that they do not have a future? That they will never grow up to have a family of their own, or a career? That they are likely to die before they are 25? We are taking each day as it comes and loving our daughter and trying to make her life as happy and “normal” as we can.